You can still get signed copies of this gripping book at Book Soup. This is the best book ever written on Mickey Cohen and one of the greatest crime books of all time, destined to be treasured by anyone interested in Los Angeles history. Packed with photos, a detailed “cast of characters”, a bibliography, and completely indexed, this book should be on your shelf. Also popping up at Tere’s one hour talk at Book Soup was a former member of the Los Angeles Police Department’s Intelligence Division, who made some interesting comments, including the fact that he had arrested many of the individuals mentioned in Tere’s book. 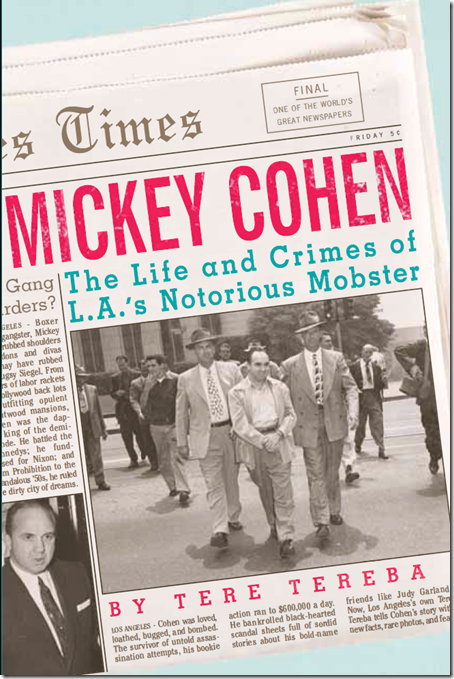 Another person in attendance, a blond lady, claimed that Mickey Cohen tried to “pick her up” when she was a young woman working in downtown Los Angeles. Tere Tereba’s presentation at Book Soup is a classic, bringing out a lot of “old timers” who remembered or had some connection with Mickey Cohen and the exciting days of the 40’s and 50’s in our City of “Angels”. This entry was posted in Books, Celebrities, Events, Hollywood People and tagged Book Soup, bookmaking, Bugsy Siegel, corruption, crime, gambling, history, hoodlems, Inc., Lansky, LAPD, Los Angeles, Luciano, Mafia, Mickey Cohen, mobsters, Murder, National Crime Syndicate, Tere Tereba, the Combination. Bookmark the permalink.